This month’s Artwalk includes an opening reception for “Intimate States | Works on Paper,” an exhibit spotlighting the work of contemporary artist Eduardo Sarmiento. 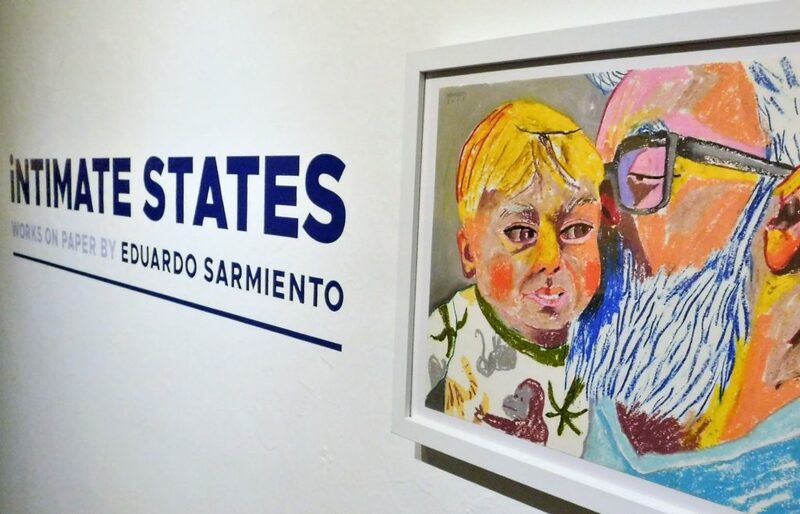 Cuba native Eduardo Sarmiento provides a glimpse into his personal life in the exhibit titled “Intimate States | Works on Paper” starting this week in the main gallery at the Thomas Center Galleries, 302 NE 6th Ave. The public is invited to an opening reception for the exhibit on Friday from 7-9 p.m. during the monthly Artwalk Gainesville. The event will include an appearance by the Jacksonville-based artist as well as live music by the Front Porch Backsteppers in the Spanish Court. The exhibit is the kick-off event of Bulla Cubana, a city-wide celebration of arts and culture, promoting the exchange of ideas and inspiration between Cuba and the North Central Florida region. Additional Bulla Cubana events will showcase the talent of invited fine artists, muralists, dancers, musicians, chefs, photographers and filmmakers from March 9-24. Sarmiento was born in Cienfuegos, Cuba, in 1980. He moved to Jacksonville more than a decade ago. Anne E. Gilroy, curator of the Thomas Center Galleries, said she has been a longtime fan of Sarmiento’s work. “Jardín” (oil pastel and colored pencil on Arches paper), a portrait by Eduardo Sarmiento depicting the artist upon first hearing the news of his wife’s pregnancy. In more than two dozen powerful drawings, Sarmiento allows viewers to witness his connections to family and friends. Neither idealized nor forgiving, the portraits deliver tenderness without sentimentality. The “Intimate States” exhibit continues through May 4. Sarmiento will return to the Thomas Center on March 15 to give an artist talk. The evening will also include Latin dancing to music from the Elio Piedra Trio. 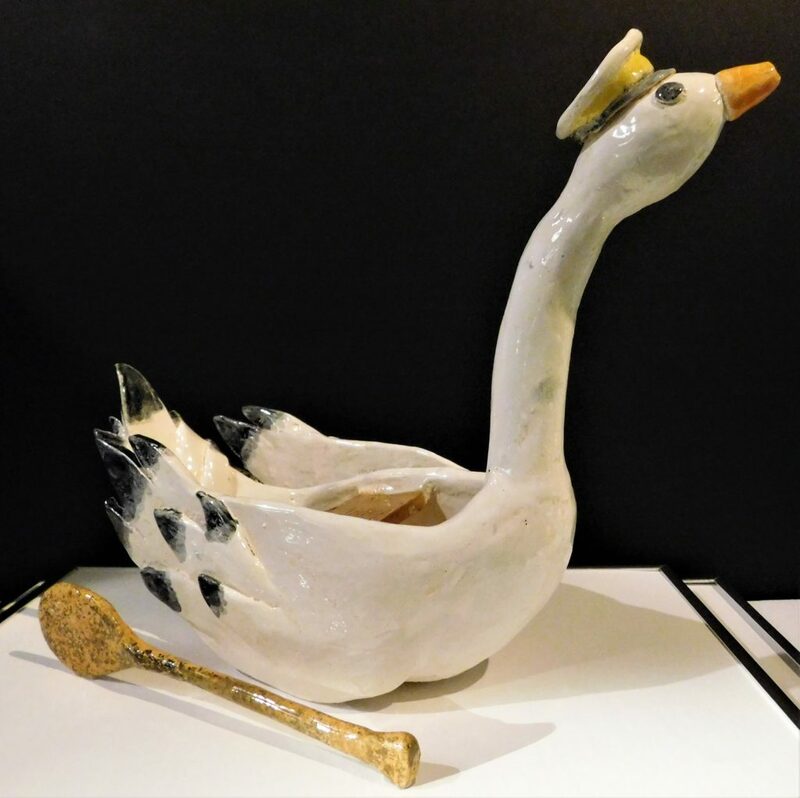 “Swan Cup” (ceramic), by Haley Pleiman, a sophomore at Gainesville High School. Her instructor is Sara Truman. Meanwhile, tonight’s Artwalk festivities at the Thomas Center will also mark the opening of the Alachua County Public Schools Visual Arts Showcase in the second-floor Doris Bardon Gallery. The exhibit will include 104 pieces selected by K-12 art teachers throughout the school district. Etling said that people have told him that the first work they ever had displayed in public was at the Historic Thomas Center during past showcases. 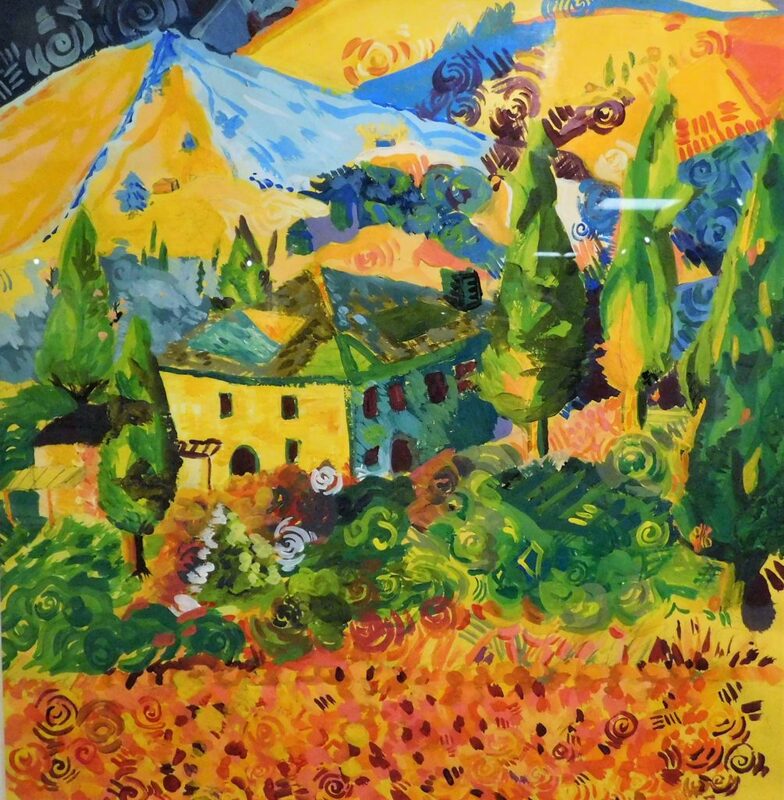 “Colorful House” (tempera), by Montana Hoffman, a sophomore at Buchholz High School. Her instructor is Lindsey Lugrin. First Magnitude Brewing Company (1220 SE Veitch St.): Hosting a variety of artists, including Jenna Horner, Gracie Allen (High Top Vintage), Melody Tunks (Henna Tattoo), Alix Mathia, Rose Godfrey (One Healthy Planet, LLC), Amber Rohlman/Apolo (massage), Violeta Lizama (Purple Star Shop), Jaya Holmes (Jaya Holmes Brew), Melinda O’Rourke (Earth Tonix, Gwen Gadaire, Samm Wehman Epstein and Daniel Holtzhouse. There will also be live music as well as food trucks and craft beer. Note: Artwalk hours 6-9 p.m.
Hippodrome Gallery (25 SE 2nd Place): Presenting the exhibit “From the Inside.” Since 2013, volunteers of the Journey Daybook organization have taught the process of making illustrated journals to small groups of incarcerated women at the Florida Women’s Reception Center (FWRC) in Lowell. For the women incarcerated at FWRC, creating pages is a method of personal expression in a life moving too slow. This exhibit is a collection of journey daybook pages made by some of the women who have completed the program and are now Journey Daybook alumnae. Gallery is also open during Hippodrome business hours and during evening events. Maude’s Classic Café (101 SE 2nd Place): Welcoming local artist Brittany Boyer. Somewhere Along the Way (201 SE 2nd Place, Suite 110): Featuring work by dozens of local and regional artists in the atmosphere of a coffee and wine bar. Live music by Mark Miale and Tony McMahon. Sweetwater Print Cooperative (117 S. Main St.): Presenting “New Year’s High/Low Art Project.” Co-op members celebrate the new year by offering high quality art in various media at low prices to thank art lovers for their support of the gallery and studio and to welcome those new to Sweetwater. The exhibition continues through Feb. After Artwalk, the gallery is open on Thursday afternoons and Friday mornings, or by appointment by calling Stewart Thomas at 352.514.3838. 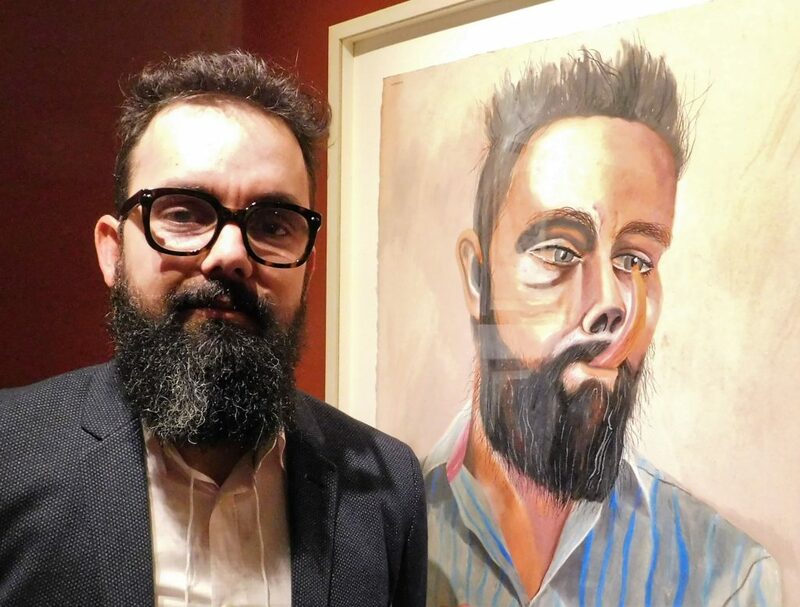 The Bull (18 SW 1st St.): Hosting “About Face,” drawn portraits by Josh Wilson. The portraits explore the beauty and expressed emotion of the human face, defined by the line. Wilson has been offering his unique take on Gainesville for more than a decade. Bluegrass music by the Front Porch Backsteppers at 9 p.m.
High Dive (210 SW 2nd Ave.): Presenting UNVEILED2, the sequel to High Dive’s popular October event celebrating nudes and sensuality in art. Live performances include pole dancing, a fetish class and burlesque. This show will exhibit the talents of some 20 local artists. The SL8 (10 E. University Ave.): Featuring Nathan Grimes and his show, “NXT LVL SHT!” Other artists include Howard Wapner, Virginia Zuesdorf, Jason Clark, Michael Levy, Amye Francis, Lucas Thon, Charley McWhorter, Natacha Monalisa, Jade DiMarco, Pate, Jiri Lonsky, Lennie Kesl, John Korb, Josia Lloyd and video animation by Corey Collins. The Galleries at the Historic Thomas Center (302 NE 6th Ave.): Presenting the opening reception of “INTIMATE STATES – Work on Paper” by Eduardo Sarmiento. Sarmiento’s masterful work will be featured in Gainesville for the first time, in concert with the upcoming Bulla Cubana festival. Powerful self portraits along with portraits of family and friends disclose potent connections between artist and subjects. Sarmiento offers himself up to the viewer in this raw visual consideration of relationships. Meet the artist at the Artwalk opening reception from 7-9 p.m. Live music by the Front Porch Backsteppers. Hardback Undertown (920 NW 2nd St.): Featuring a retrospective of previous Artwalk pictures. The Hardback will also offer imported cheeses from Dorn’s Liquors and music, to be followed at 10 with local bands Boston Marriage and Guts. Artists like Brian Wilson (next month’s featured artist) and Scott Littler, Harold Gertner, and Emma Jean Fulgham, Michael Garvin, and Rob Dark, Kara Gomes and Anastasia Overton. The Collaborative Shoppe (532 N. Main St.): Several guest artists will be on display in addition to Shoppe artists Rootzy Fair Trade, Design by Jessanne, Beachy Beads, finn+piper, Designs by Fur, Simone’s Natural Notions, Bookish Apothecary, Ted Zysk, authorized maker for MyIntent. There will be a create and take station in the DIY Workshops area. The Collaborative Shoppe is an Artisan Boutique, DIY workshop and event venue. The Atomic Ark Gallery (1801 NE 23rd Ave., Suites C1-C2 — across from Satchel’s Pizza): Presenting “The Evolution of Furniture Design,” showcasing the evolution in furniture design from the post-war era of the 1950s with its “Atomic” influence, continuing through the end of the 1970s’ Space Age Modern movement and everything in between. The AUK Market (2031 SW 6th St., in the Curia complex): Featured artist vendors include Cindy Steiler, Molly Kempson of Spotty Boy Press, Cheyenne & Nigel Rudolph of Rudolph Clay Studios, and Angela Deane. Offering selections of curated vintage, handmade pieces, and art. The AUK Market is a creative business collaboration with Zorka Rose Vintage, Timber Line Jewelry and La Chua Vintage. For further info, visit the Artwalk Gainesville website.